GIRLS ROCK! 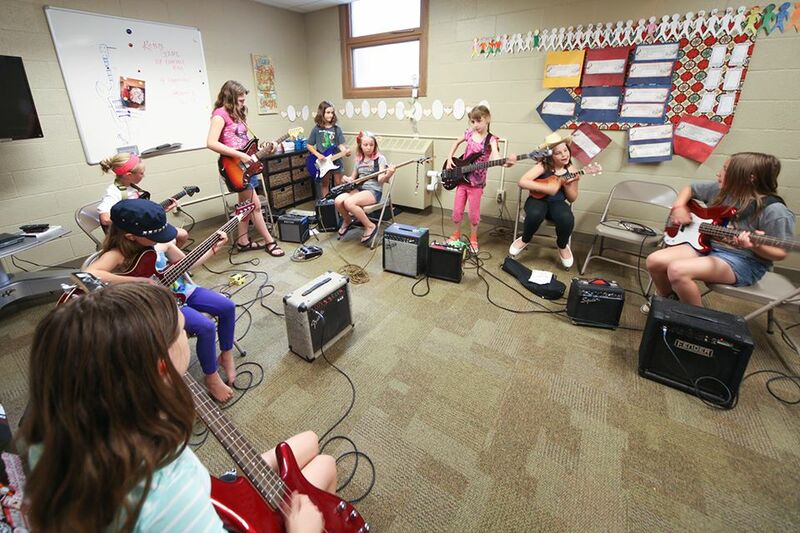 IOWA CITY is a 501(c)(3) non-profit community organization dedicated to fostering creativity and self-esteem through musical instruction and expression. 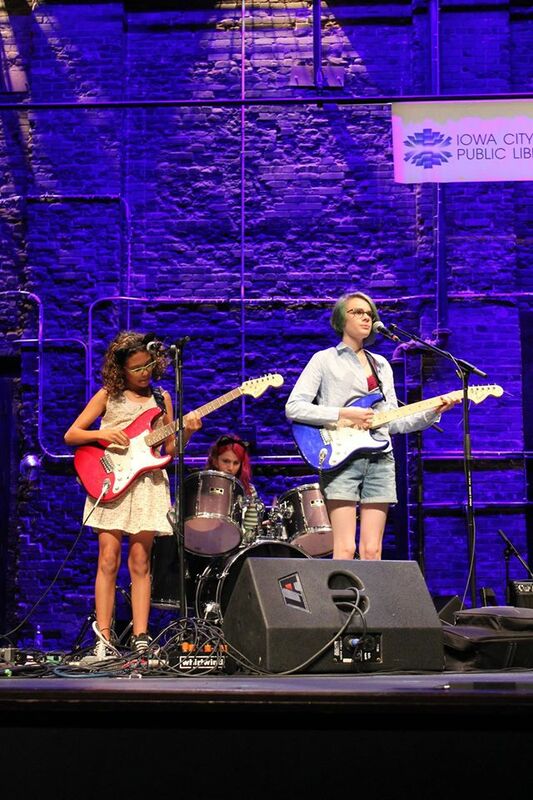 Through our programming, we offer all female, trans and nonbinary youth ages 8-16 an opportunity to gain technical and musical skills that enable them to express their ideas with the support of a community that values their unique perspective. In addition to working independently, Girls Rock! works to integrate its programming with other non-profits and businesses in Iowa City in order to create a sense of community that upholds and celebrates the work of young artists; in the past, this has included performances and workshops with The Englert, the Iowa Women's Music Festival, the Iowa Youth Writing Project, Public Space One, and One Book Two Book. By providing this programming, we hope to start a conversation that challenges assumptions about what girls can do and become. 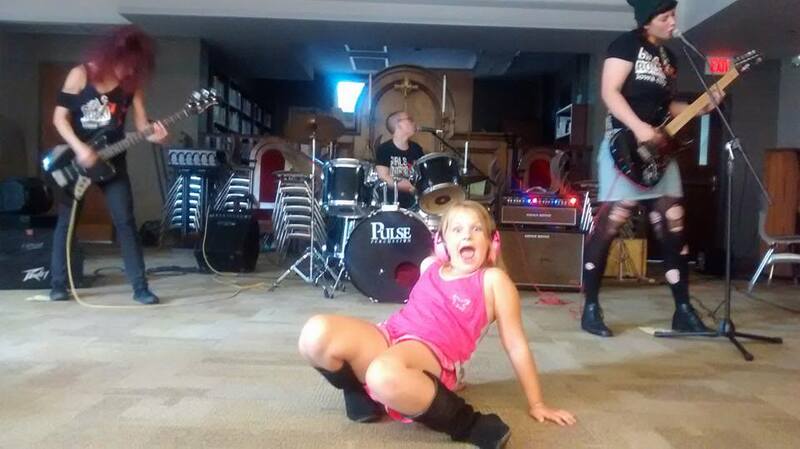 Our week-long day camp allows campers to form bands and write an original song. At the end of camp, bands perform their original songs at our showcase, an event that is open to the public and attracted more than 150 people in 2016. 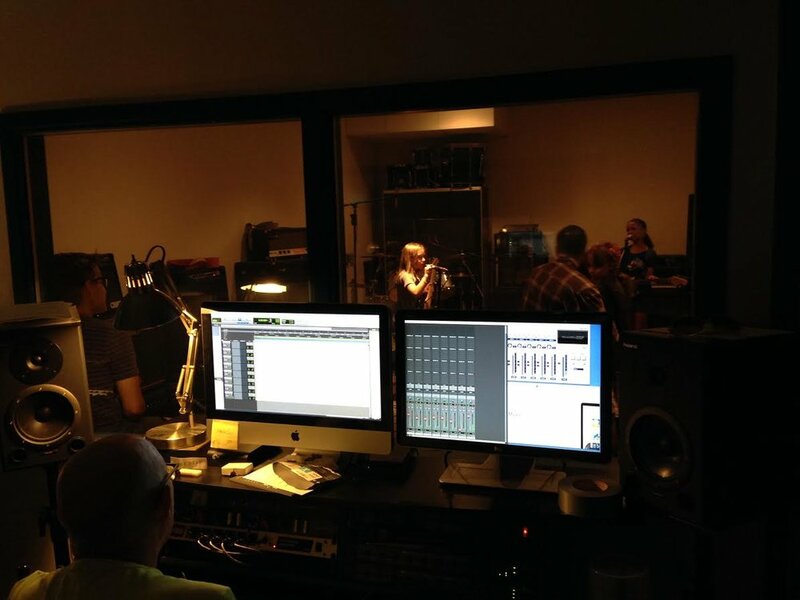 Songs are then recorded in the studio at the United Action for Youth, and recordings are made available to campers and the public. In addition to our week-long camp, We offer Saturday morning workshops through the United Action for Youth. These workshops cover topics like journaling and creative writing, zine-making, and self-defense. All Girls Rock! 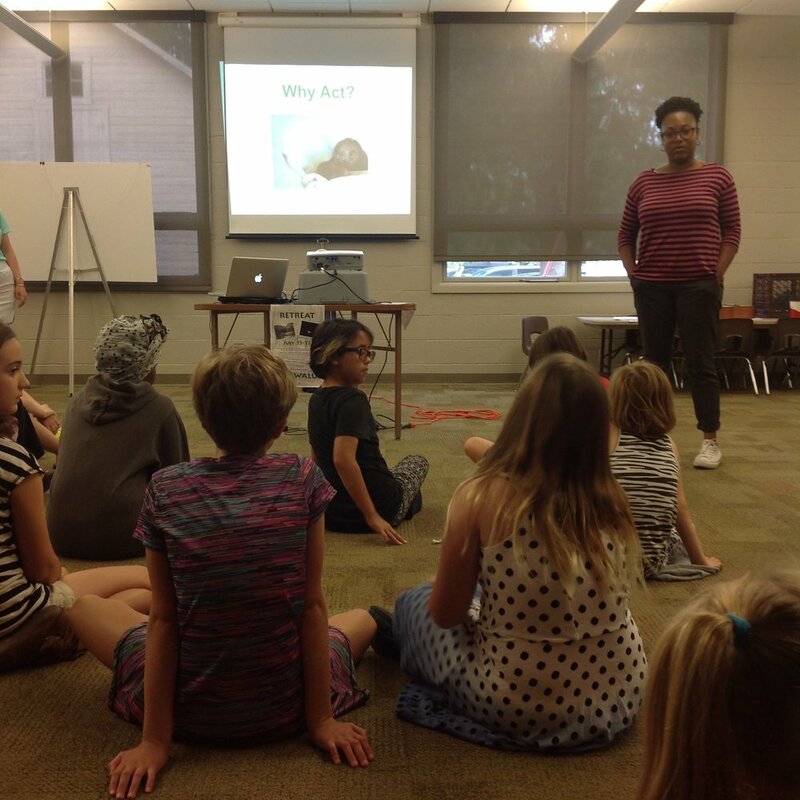 Iowa City programming is open to female, trans and nonbinary youth ages 8-16. All tuition exists on a sliding-scale and is pay-what-you-can; the majority of campers attend our week-long camp at a reduced rate, and 20% will attend for free in 2019. No musical experience is necessary to attend, and most campers are beginners. Any needed instruments and equipment are loaned during camp. Girls rock! Camp 2019 is full! To apply to our waitlist click here! TO donate or to PAY TUITION FOR GIRLS ROCK! CAMP 2019 CLICK HERE! Girls Rock! 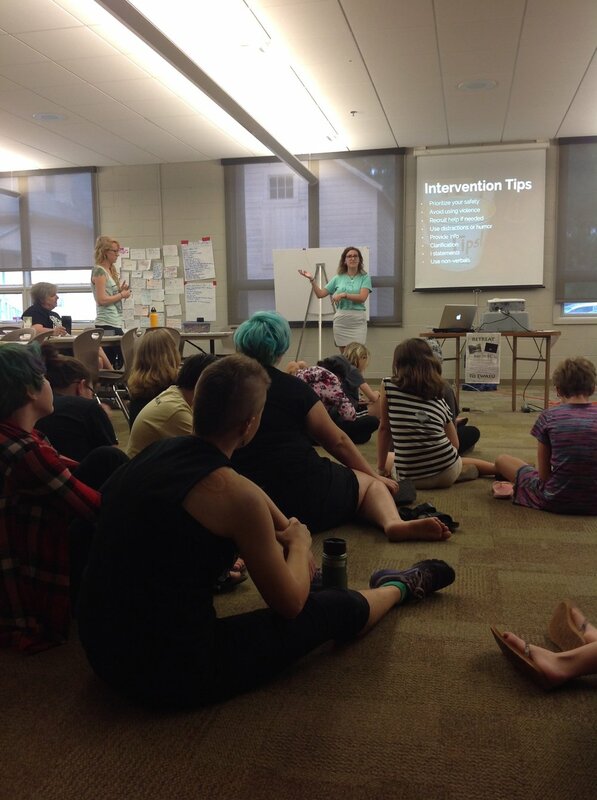 Iowa City is open to all female, trans and nonbinary youth ages 8-16. No previous musical experience is required to attend; the majority of campers are beginners. All musical instruments and required equipment are provided for campers during camp and performances. Tuition is based on a sliding-scale, and is pay-what-you-can; about 30% of our campers attended for free in 2017, and the average camper paid about $130 to come to camp. We also offer free lunch and before- and after-care to all campers. 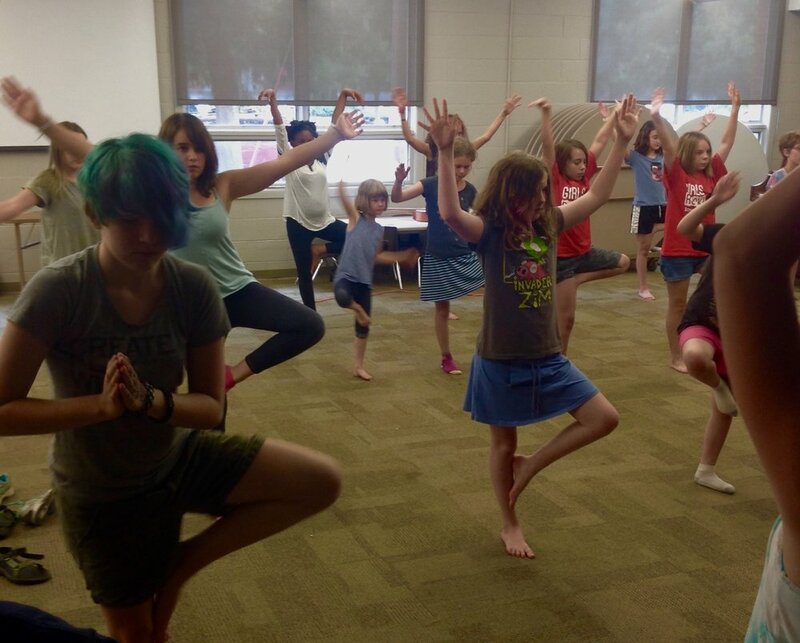 We are dedicated to being flexible and accommodating to the diverse needs of our campers and their families so that everyone who is interested is able to attend our programming. Our summer camp program is one week long, with lessons and practice Monday-Friday, and our showcase and recording on Saturday and Sunday. 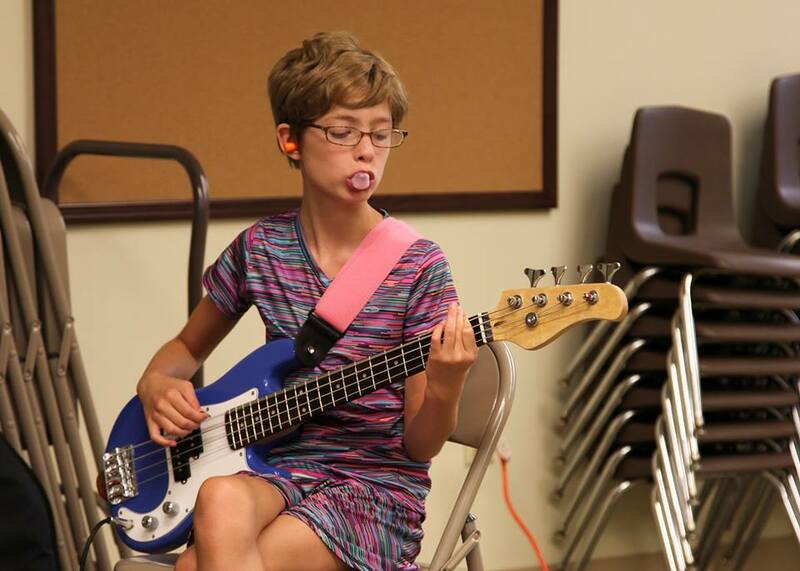 Monday-Friday, campers will attend small-group lessons on the bass, guitar, keyboard or drums, followed by workshops in areas like songwriting, self-defense, and the history in women in music. 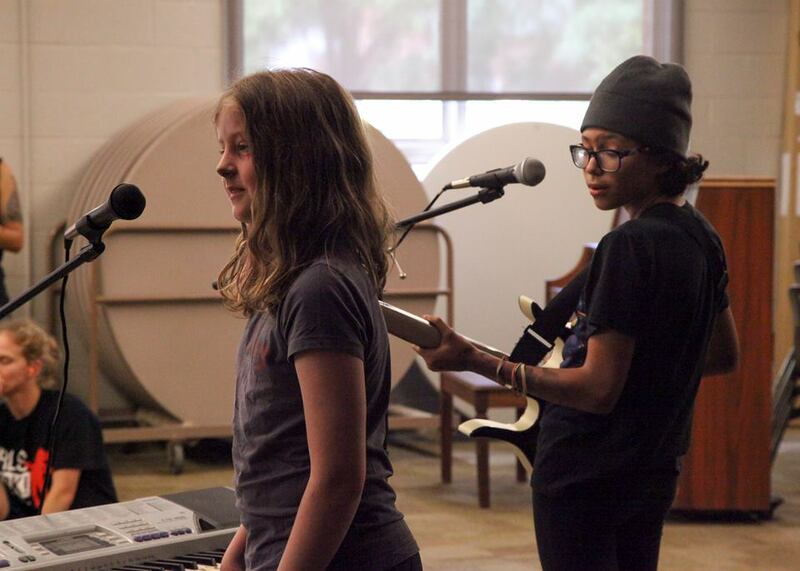 Campers will work Monday-Friday with their band as they write an original song. On Saturday afternoon, campers will perform their original song at the showcase, which is open to the public. On Sunday morning campers will record their songs in the studio at the United Action for Youth. Our programming is staffed entirely by volunteers, and we are always in need of excited people to help us put our programming together! Our week-long camp is staffed entirely by female, trans and nonbinary volunteers with a variety of skill sets! At camp, there are three primary categories that most volunteers fall into: counselors, band coaches, and instrument instructors. Consistency is key in these important roles, and we request that you only apply for these positions if you are capable of making a commitment to the full week of camp; we also have a number of part-time opportunities for people with less flexible schedules. Girls Rock! Iowa City 2019 will take place the week of June 24-30. We have flexible positions for people of all skill levels, with no musical experience necessary. Stipends are available. We are always in need of volunteers to attend promotional events, move gear, and staff events in the community throughout the year. 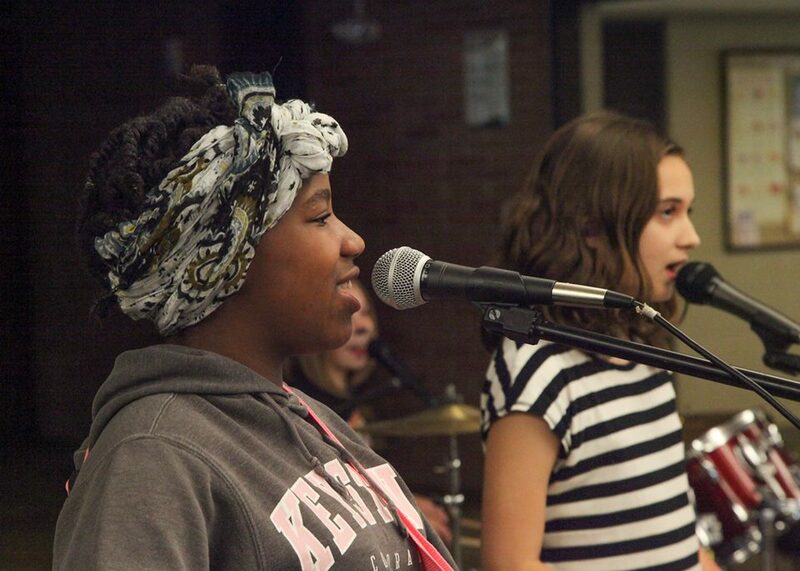 Please email us at volunteers@girlsrockiowacity.org so we can keep you informed of upcoming volunteer opportunities! We think that every kid deserves to feel heard and supported, and because of that we seek to make our programming as accessible as possible to as many campers as possible. That freedom has always been facilitated by generous members of our community.. Your donation will help us reach and empower future musicians. Thank you! 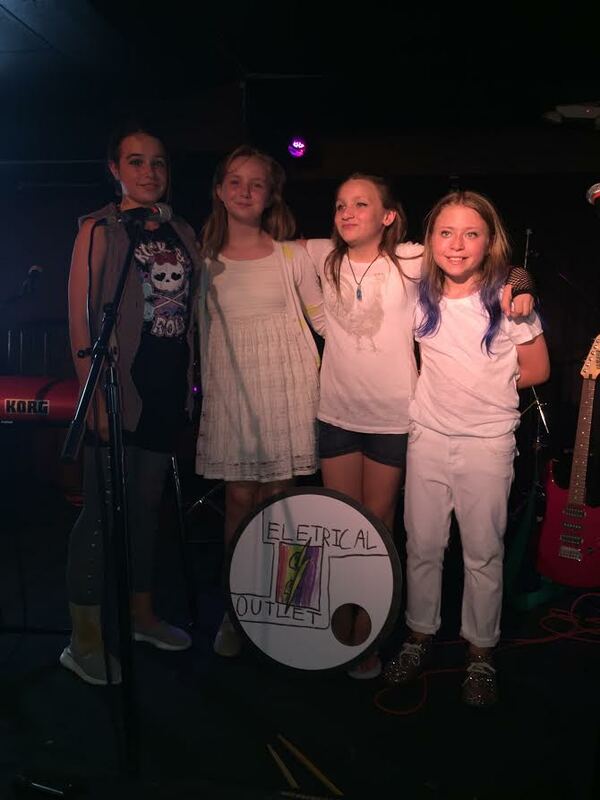 TO DONATE TO GIRLS ROCK! IOWA CITY CLICK HERE!